Grow your own onion "sets," and you'll be amazed at the difference compared to store-bought varieties! This white onion is great to try first, since it produces record yields of large bulbs for the biggest, whitest onion slices you've ever seen! Home grown onions will make a difference in any dish you add them to: stir-fries, stews, salads, burgers--whatever the dish, one bite is all it takes to notice the difference. 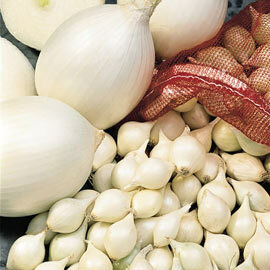 Much milder than yellow onions, white onions are sweeter with a cool, crisp, fine-grained texture. Plant them in well-drained loamy, sandy soil in full sunlight for best results. Spacing: 2 - 4 inches apart. Depth: 1 - 2 inches deep and 2 - 4 inches apart. Soil Preference: Well-drained, loamy, sandy soils.